It nearly didn’t happen, though. We decided to watch it at the Sky Building in Umeda. However, we didn’t realise that today was “movie day”. In Japan, cinemas reduce their prices on the first day of each month. Instead of being very expensive, the prices are cut to what would pass for only slightly expensive in other parts of the world. We hadn’t realised this, and apparently the JPY 500 discount precipitates a rush, because when we arrived ten minutes before the showing, they were selling tickets for standing only. And I’m not paying JPY 1,000 to stand up for two hours. So after that dismal failure, we headed on to Namba. Seen Blade Runner? That’s the place. In the daytime, it looks kind of tacky; you have to wait for nightfall and neon to see it in full cyberpunk glory. 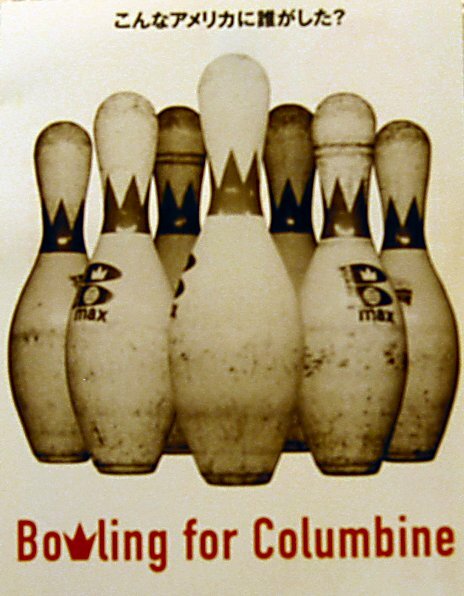 There was another cinema showing Bowling For Columbine there. And they still had seats left. What about the film? I’m sure that there are far better reviewers than I, so I won’t try to write anything approaching a comprehensive review. Just a few impressions. From the start, we’re left in no doubts about Michael Moore’s point of view. “The President bombed another country no one had heard of...it was a normal day in America.” (That’s probably not an accurate quote; I’m writing from memory.) It would be a stretch to describe BFC as objective. Far from it. In fact, whilst I share many of Moore’s convictions, I’d have preferred to see a more balanced presentation. However, as long as BFC is taken with a pinch of salt, despite its weaknesses, it gives the viewer a lot to think about. It’s common knowledge by now that the CIA trained Osama bin Laden to fight the USSR, and that Saddam Hussein bought weapons from the US and UK back when he wasn’t the enemy. But presented in context with all the other instances of misguided US involvement in foreign countries’ internal politics, which Moore does through a montage, it’s disturbing. In the case of the titular Columbine, the most shocking aspect of all is not the fact that three students shot some other students, it’s that they were able to shoot so many using semi automatic weapons which they easily obtained. As the father of one of the murdered students pointed out, a 9mm semi automatic is not used for hunting deer. It’s designed for killing people. If you haven’t already, go and watch it. It might make you think, too.